The Brooklyn Museum is hosting some tremendous exhibitions over the next couple of months, including works from Ai Weiwei, early feminist pieces from Judy Chicago, an exhibition featuring art and civil rights in the 1960s, and much more. One of the Brooklyn Museum’s current exhibitions that we are most excited about features remarkable works from local artist Swoon. Swoon, a Brooklyn-based artist who studied at the Pratt Institute, is known for her life-size wheatpaste prints and intricate paper cutouts that often depict scenes of humanity. In addition to being recognized for her signature style, Swoon represents the often overlooked and extremely talented female street artists of New York City. After finding her voice as a street artist, Swoon began creating deeply meaningful and detailed installations at an even larger scale. Her latest, called Swoon: Submerged Motherlands, is on display now at the Brooklyn Museum. 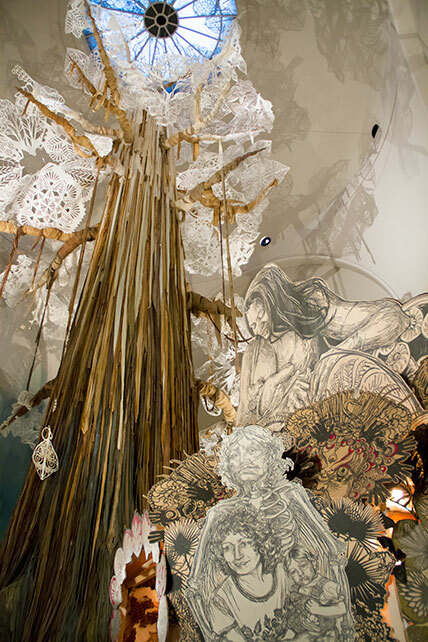 In Submerged Motherlands, Swoon has created a site-specific installation in the Brooklyn Museum’s rotunda gallery, transforming the space into “a fantastic landscape centering on a monumental sculptural tree with a constructed environment at its base, including sculpted boats and rafts, figurative prints and drawings, and cut paper foliage,” details the museum. 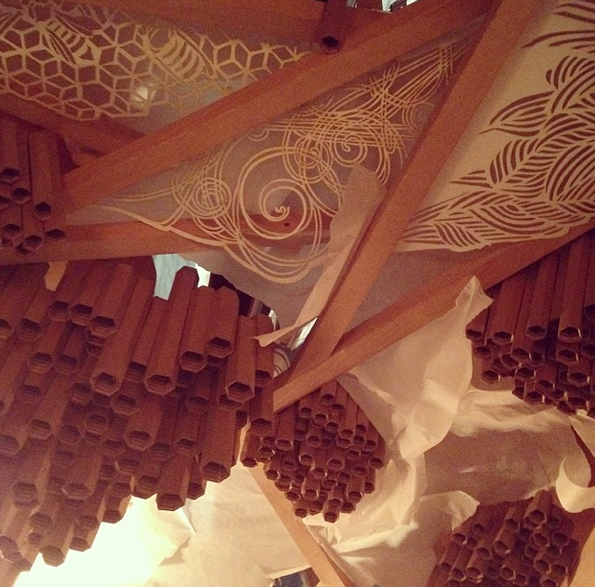 Swoon, who has found artistic inspiration in contemporary and historical events for some of her past works, was reportedly driven to create Submerged Motherlands after Hurricane Sandy ravaged the Atlantic Coast in 2012. Explains the Brooklyn Museum, “Swoon celebrates everyday people and explores social and environmental issues with her signature paper portraits and figurative installations.” If you’ve never seen the prolific local artist’s wheat-pasted posters on some of Brooklyn and Manhattan’s industrial buildings, then now is your chance to see her work featured at the Brooklyn Museum. Swoon: Submerged Motherlands is on display until August 24th, and features some of the artist’s most impressive work to date. Learn more about this exhibit and others by visiting the Brooklyn Museum’s current exhibitions page.